So when I designed “Snake Goddess,” yet another tribute to this beautiful culture for my book Beading Her Image: Images of Women Portrayed in 15 bead Patterns, I naturally used colors similar to those of Minoan frescoes. I updated them, of course, to appeal to contemporary eyes accustomed to clearer, brighter hues. A t its core this palette is a primary triad based on the red/yellow/blue pigment wheel: red, gold as a substitute for yellow, and three shades of blue. Variations of this primary triad, often muted and darker, are found all through Egyptian murals. 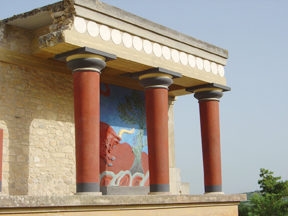 The essence of Egyptian color usage is three-to four-color combinations hinged on red or yellow… Add a verde green…and you have the full palette for most Egyptian wall paintings, and the famous Minoan bull mural. 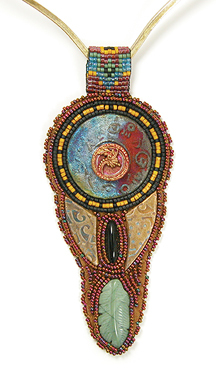 Heidi Kummli designed a pendant project (below) for The Beader’s Color Palette based on this 4-color palette. Let’s talk about triads, specifically, the primary triad. Triadic combinations exhibit bold, energetic and striking contrasts because the members of the group, spaced as they are on the wheel, are neither analogous nor complementary. Basic triads contrast strongly in both temperature (warm and cool colors) and value (light and dark colors). Because of its bold directness, the primary triad of the traditional pigment wheel—in its purest red-yellow-blue state—is often used in children’s toys and graphic design. Challenge yourself to create an innovative scheme based on this powerful trio whose roots reflect a society who celebrated what was most important: joy, nature, partnership, and beauty.